Telephone the patient’s doctor who will visit to confirm that death has taken place. Arrange to collect the doctor's Medical Certificate of Death (usually from the surgery). Take this to the Registrar’s Office, (together with the deceased's Medical Card and Birth Certificate, if available) for the area in which the death took place. Alternatively you can register by declaration at any convenient Registrar’s Office but certificates will not be available as these will have to be posted to you a few days later. The Registrar will normally issue a Green coloured certificate for you to give to your funeral director who will look after necessary arrangements for the funeral. The Registrar will also issue a white notification certificate for the DSS. They will also enquire as to the number of Certified Copies you require for dealing with the deceased finances (a fee is payable for each copy). Contact a funeral director to inform him his services are required. Admiral nurses are mental health nurses specialising in Dementia care in the community. This group of volunteers meet weekly to knit bonnets for new born babies in Africa and ‘Twiddle Muffs’ (see right) which are offered to people suffering from the later stages of Dementia. 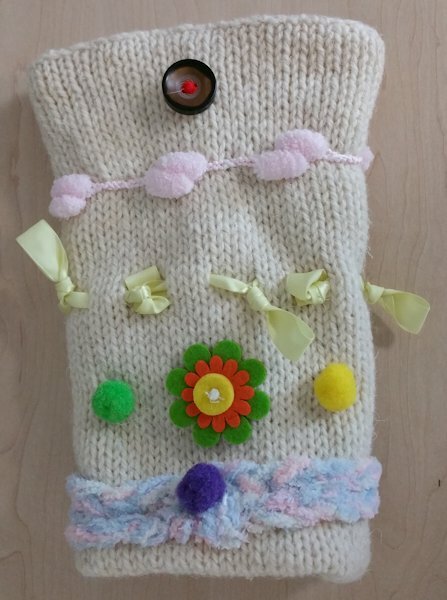 The Twiddle Muff is, as the name suggests, a simple muff which people can use to keep their hands warm but it also provide simple and relaxing stimulation to people in the later stages of dementia as it is covered with colourful buttons, bits of ribbon, etc which a demented person can ‘twiddle’. A twiddle muff knitted by the group found its way into a nursing home in Ireland. It was so well receive they have started to produce their own muffs. If you have any spare wool that you no longer need please drop it in at the surgery reception. We will ensure it is passed onto the group who are always very grateful for any donated wool. This is a very informative and useful downloadable booklet developed by Alzheimer Scotland. It is designed to help carers cope with the challenges of caring for a person with Dementia. This local charity can help towards providing respite care for those living within the Ashton area (Stubshaw, Bryn, North Ashton, Garswood and Pewfall are included). This may be by providing money to the carer or the persons they care for towards a holiday or some other respite care or provision up to a total of £500. Respite grants aim to give people a break, especially when a carer is under pressure from long hours caring for someone with a disability or long-term illness. Individuals can make application on their own behalf, but all cases brought this way will need to be investigated. Alternatively, ministers of religion, charitable organisations and local government bodies themselves can make an application on behalf of a client of theirs if they have somebody specifically in mind for a grant. Grants made through agencies and ministers, etc., do not require additional validation. Application forms and further information can be requested via email to the linen.charity@aol.uk or by letter to the Clerk at 31 Satinwood Close, Ashton in Makerfield, Wigan, WN4 9NL or Tel: 01942 273721.